One of Jordans undiscovered gems is Herod the Greats ancient fortress of Machaerus, located by the village of Mkawer. There, it is said, the beautiful Salomé danced for Herod Antipas, who presented her with the head of the Prophet Yahya or John the Baptist to honor her wishes. According to Matthew 14: 9-12, "The king was sad, but because of the promise he had made in front of all his guests, he gave orders that her wish be granted. So he had John beheaded in prison. The head was brought in on a plate to the girl, who took it to her mother." The fort was perched on a 700-meter-high hill which was first fortified about 100 BCE, and expanded by Herod the Great seventy years later. The greatest attraction of Machaerus, however, is the stunning panoramic view it presents of the surrounding countryside, the Dead Sea, and the West Bank. On a clear night you can easily make out the lights of al-Quds (Jerusalem) and Ariha (Jericho). Far removed from the tourist circuit, the quiet of this area transports you back into Biblical times. Indeed, shepherds and their flocks still find shelter in the myriad caves and grottoes around Machaerus. Hike down towards the Dead Sea from Machaerus and you will truly feel that you are on top of the world. Mkawer is about 40 kilometers southwest of Madaba. To get there, go from Madaba south to Libb, then take a right and continue on the road until it ends in front of Machaerus. Food is available in Mkawer at Herods Rest House. The hot springs and baths of Hammamat Maeen have been enjoyed for therapeutic and leisure pursuits for thousands of years. The public springs and commercial resort area are located 35 kilometers southwest of Madaba, along a winding road which crosses some of the most spectacular territory around the Dead Sea. It is, however, impossible to drive directly from Hammamat Maeen to the Dead Sea. Hammamat Maeen should not be confused with the actual town of Maeen, which is 15 kilometers before the springs. Therapeutic hot springs at Hammamat Maeen. 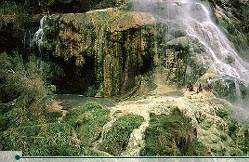 The main public attraction is a large spring-fed waterfall, while a number of smaller ones spurt forth within the private resort area (08-545-500). Shower facilities and a swimming pool are also available for public use. Within the spa complex, one of the most popular attractions is the body mud pack treatment, followed by showering and a hot bath. Other spa and health facilities are also available in Hammamat Maeen, as are accommodations. The hot springs are open from 08:00 until midnight daily. Variously known throughout history as Qir Heres, Qir Moab, and Hareseth, Karak has been a prized possession of a number of civilizations. It lies on the ancient caravan routes that used to connect Egypt to Syria, and its commanding position almost 1000 meters above the Dead Sea Valley made it a strategic asset of great importance. The city was the ancient capital of Moab, and was also used by the Greeks and Romans. During Roman times it was known as Characmoba. Karak Castle. © Zohrab But it was not until the arrival of the Crusaders in the 12th century that Karak reached its full splendor. It is recorded that the Crusader King Baldwin I of Jerusalem had the castle built in 1132 CE. With its location midway between Shobak and Jerusalem, Karak formed part of a great line of Crusader castles stretching from Aqaba to Turkey. Karak became the capital of the Crusader district of Oultrejourdain, and, with the taxes levied on passing caravans and food grown in the district, it helped Jerusalem prosper. Even with its impressive defensive fortifications, Karak could not hold out against the forces of Salah Eddin. After the governor of Karak, the infamous Reynaud De Chatillon, broke several truces with Salah Eddin, the Muslim leader responded with a massive bombardment of Karak. De Chatillon, who was captured and executed by Salah Eddin in 1187 CE, was known for throwing his captives off the top of Karaks battlements with wooden boxes over their heads to ensure that they remained conscious until they hit the ground. Salah Eddins armies besieged and conquered the fortress in 1188, marking the beginning of the Crusaders loss of power throughout the area. The Mamluk Sultan Baibars refortified the castle in the late 13th century, and it was also later used by the Ottomans. The fort itself has been partially restored, and is a maze of vaulted passages and rooms. To the west across the moat is the tower from which De Chatillon cast his prisoners to their deaths. The tower in the northwest corner was added by the Mamluks in the 13th century. The multi-storied building at the southern end was the dungeon. To the right of the castle entrance, a stone staircase descends to the museum, which holds one of the many copies of the Mesha Stele, along with Mamluk pottery, and Nabatean and Roman coins. The castle is open free of charge during daylight hours, while the museum is open daily 09:00-17:00 with a 1 JD admission. The town of Karak lies 129 kilometers south of Amman, or 88 kilometers south of Madaba. Within Karak, numerous small hotels are available. Karak can be reached via the Desert Highway by turning right at Qatrana. However, the Kings Highway is the recommended route, as it will take you over one of Jordans most spectacular sights, Wadi Mujib. About 50 kilometers north of Karak, this canyon is over 1000 meters deep. Wadi Mujib was the "Arnon Gorge" or "Arnon River" of the Bible (Numbers 21: 24; Judges 11: 18), a natural boundary which separated the Moabites in the south from the Amorites in the north. Salah Eddin al-Ayyubi, the founder of the Ayyubid dynasty, began his career as a lieutenant in the army of Noor Eddin, the Sultan of Mosul. During the campaign against the Fatimids of Egypt, Salah Eddin rose prominently as a warrior of great dexterity and tactical awareness, and accordingly was promoted to commander and later minister. In 1171 CE, he removed the last of the Fatimid caliphs, and from Egypt, he began the conquest of Syria and attacked the Crusaders. This period of warfare against the Crusaders earned him considerable respect and some notoriety in the West. Indeed, he was seen as the arch enemy of Richard the Lionhearted. In 1187, Salah Eddin (known as "Saladin" in western literature) crossed the Jordanian highlands near Ajloun. He inflicted a decisive defeat on the Crusaders at the Battle of Hittin, opening the way for the liberation of al-Quds (Jerusalem) while placing Jordan and Egypt under his rule. The Ayyubid dynasty would rule much of these lands for the next eighty years. Salah Eddin was also famous for his sense of justice and generosity to the poor and the weak. After he conquered Jerusalem, he guaranteed the 100,000 Christian inhabitants security of life and property. Furthermore, Salah Eddin did not confiscate the amassed wealth of the Christian patriarch, but instead provided guards for the patriarchs safe transit to other Christian habitations. This benevolent treatment of the Christians was exemplified yet another time, when Richard the Lionhearted became ill and Salah Eddin sent his personal physician to treat the general. Following the death of Salah Eddin in 1193, the Ayyubid dynasty divided. In 1200 CE his brother Sultan al-Adel Saif Eddin Abu Bakr appointed Sharif Qatada ibn Idris of Yanbu to be the new emir of Mecca. The Emirate of Mecca remained within Sharif Qatadas ancestry for over 700 years, the last emir of Mecca being Sharif Hussein bin Ali, King of the Arabs and great grandfather of His Majesty King Hussein I.